Enclosed cargo trailer cabinet accessories are designed to make a trailer more functional and organized. There are many factors to be considered when deciding what accessory options are the best. It is important to be well informed when it comes to choosing the best accessory options. Another thing to keep in mind is whether the new accessory will change the way the trailer functions, and, if it does, whether the change is worth the enhancement. The accessories are designed for enclosed trailers, but many are also sufficient for other applications, including open trailers or even areas of homes and workshops such as sheds. Accessories can help to improve the functionality of the organization of said trailer. These parts are not designed specifically to be for visual enhancement. Many options are aesthetically pleasing and will help enhance the overall organizational and functional design inside of the trailer. It is important to select a model with all the necessary features for your intended trailer use. The drawers and cabinets should be just right for the situation. For instance, anyone who goes through a significant number of zip ties should choose a cabinet with a convenient dispenser for them. One of the options Moduline Cabinets has available for an accessory is a parts bin where parts are organized into one bin that keeps each type of part separated. Weight is another important thing to consider. It is crucial to choose cabinets made of lightweight materials as not to reduce the trailer’s function by becoming too heavy. 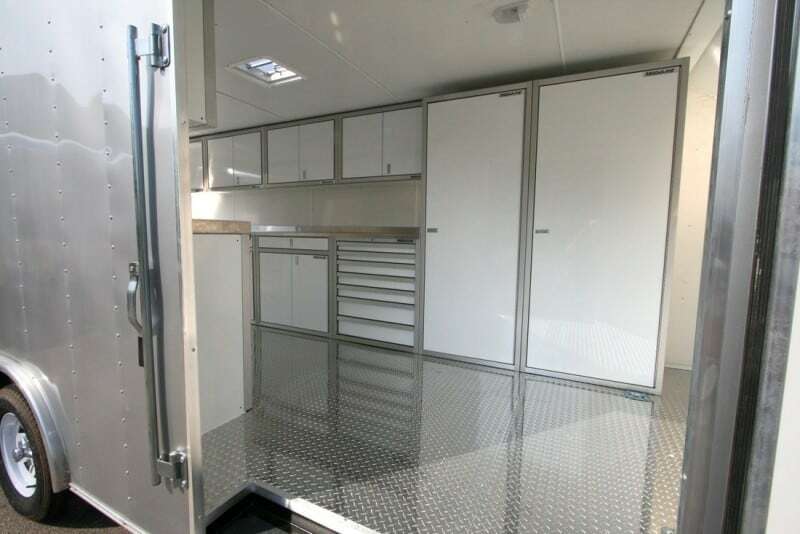 A variety of sizes and cabinet types is another feature that assists in the layout of the cabinets inside the trailer. Moduline Cabinets has a number of enclosed trailer cabinet styles and sizes available for different layouts. Moduline’s uncompromising quality for lightweight high alloy aluminum cabinets fits the needs of any mobile application.